That's true. and I haven't minded the slower parts in the other movies. I think part of it for me was I got distracted when I started watching it and it was just hard for me to get as interested after that. Though I did like the movie overall. If I can find time to watch it, I'd be happy to chime in. Not sure if I'll find the time or not. And it's been too long since I've last seen it to off up any comments. I don't even remember why I enjoyed it so much the first time around. But I do remember being surprised since as you say, it's not one of his more popular movies. Father Logan (Montgomery Clift) hears the confession of a murderer, Keller (O.E. Hasse), and urges him to turn himself in. Instead he stands by as helpless Father Logan himself is suspected of the crime and unable to tell the wily Inspector Larrue (Karl Malden) the truth. Hitchcock must have relished this plot, expanded from a play. It’s an ingenious conceit to trap a priest within his own belief system, unable to reveal anything he heard in confession, with lots of margin to turn the screws on both the characters and viewer! From the simplicity of that central theme, the story unfolds gracefully, revealing a compelling motive for Father Logan to have actually done the crime. In Montgomery Clift, Hitchcock has the perfect lead. Clift was the original method actor and a controversial choice, apparently causing some issues on set, but still, it suited the role. There isn’t a glimmer of doubt in his eyes, except when he walks the picturesque Canadian town alone, and even then it is implied he is considering turning in his frock, not the confessor. He is never judgmental or emotional. All we see is a man willing to accept whatever fate is laid out. This is an excellent depiction of faith and sacrifice, and Logan is a heroic character to rival Atticus Finch, especially given that Keller is German and Logan an ex-soldier. It's criminal that such a character is not more well known and makes this one of the most underrated Hitchcock films. Clift is ably supported by Hasse as the nervy Keller, and the late Karl Malden who is typically superb as the Inspector barely hiding his glee when he has the scent. The scene with the two of them in Larrue’s office is wonderful. The other main role is Anne Baxter as Logan’s ex-lover and potential motive. She’d recently won an Oscar for All About Eve, but this is a warmer, if simpler, role. Still the plot twists around her brilliantly as she unwittingly digs Logan in deeper while undermining her own marriage to Roger Dann. Mind you, he is a bit of wet blanket anyway, perhaps the weakest character. The film seems to lose a lot of energy during the courtroom sequence (thankfully still much better than the method used in Spellbound), as it can’t help but repeat a lot of what we already know, but the story still has a couple of twists and it’s fascinating to see how Logan still doesn’t condemn Keller, not even with a mere glance. Apparently the subject of much discussion with the Catholic savvy censors. A key to Baxter’s story is a flashback sequence which compares to Stage Fright as it is also subjective and open to interpretation because it is strictly from her point of view. Not just a technical theme, it suits the narrative in that it does not specifically explain Clift's reasons for becoming a priest and keeps him enigmatic. It’s an interesting break of pace from Hitchcock because it is so bright and romantic! He even uses slow motion at one point. The rest of the film compares with Shadow of a Doubt. It is beautifully lit, with real locations and nothing flashy, but just solid, efficient quality revolving around character, not least at its most potent during Logan’s walk. After an ironic start with road signs, it settles for an overall serious, nourish tone, but it is very compelling throughout. Interestingly, it finishes as Hitchcock often likes to do, on a stage. But this time there is no audience. I'm not sure what to make of that, if anything. There’s a quote in the making of which is worth remembering throughout this marathon: “a bad film is a photograph of people talking; a Hitchcock film is a photograph of people thinking”. Having found out about Margot’s (Grace Kelly) affair with Mark (Robert Cummings), Tony (Ray Milland) meticulously plans the perfect murder, blackmailing an old college acquaintance, Swan (Anthony Dawson), into doing the deed. 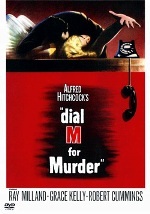 I have seen Dial M for Murder once before and I wasn’t expecting to enjoy it as much as I did this time around. It is in many ways dated, talky and staged (although that wasn’t a problem for Rope). Strangest of all, it often feels over-directed by Alfred Hitchcock, who by all accounts was bored and only doing this to honour his Warners contract. After all, to paraphrase the quote I mentioned in I Confess, this is a photograph of people talking more than thinking! It doesn’t help that he had to make it for 3D, which the Master had rightfully little faith in. As such there are multiple strange angles, cuts, cluttered foregrounds, and one bloody huge thumb! Thankfully there are only a couple of scenes obviously staged for 3D action and one in particular works brilliantly well anyway. In retrospect it’s a strange story for 3D and the compositions are therefore ingenious, making the most of the almost single set (again, like Rope). No morals this time though, just cold, hard logic in a simple, but incredibly detailed and ingenious plot, developed from a play. It hasn’t lost its roots, so it’s very much an actor’s film, but it’s never less than engrossing and is brought to life by its marvellous cast. There are essentially four main sequences, mostly shouldered by the smoothly brilliant Ray Milland as the despicable Tony. His delivery of what could be a boring screenplay demands attention, not least in his long scene with Anthony Dawson as he maps out every intricate detail of the murder he has inveigled him into committing. Then we have the murder itself, giving the luminous Grace Kelly a chance to shine as she fights back; her hand stretching out to the audience is the 3D moment I referred to earlier. It must have been shocking to the viewer for the victim to reach out to them! It’s no spoiler to say that she turns the tables and kills Swan, and that is one of Hitch’s more memorable murders from this stage of his career. It’s a fairly passive role for Kelly, but she is marvellous. Then again, she can do no wrong in my eyes, able to convey fragility and strength in equal measure. There's a lovely moment with a key between her and Milland, which reminds you of Notorious. Cummings has fun with a great character in Mark; who better to try and solve the plot than a thriller writer? Well, John Williams as the Inspector would disagree and he has to be my favourite. He is an absolute joy, appearing at first to be rather stiff and old fashioned, he can’t contain his glee every time one of his questions trips someone up. He's a similar character to the Detective in I Confess, but far less passionate, yet just as funny. And though his dedication is ultimately absurd, he’d give Columbo a run for his money and the scene of one-upmanship between him and Cummings is hilarious. Part of me feels this is more average than the tighter, more ambitious I Confess, but what could have been a dry, humourless technical experiment, ends up being great fun, with a proper villain to boo. He doesn't even do the dirty work! The remake, A Perfect Murder, is competent, if overly-serious, but you can’t find a cast like this one anymore. Should you ever be framed for murder, pray you have someone like Inspector Hubbard ready to fight your corner! Just so you all know...I haven't forgotten about this..I just haven't been in the mood for Hitchcock in the last few days. I will get them all watched eventually. I'll just probably finish up ages after everyone else. 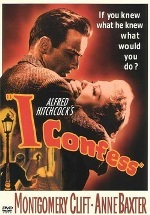 In Alfred Hitchcock's I Confess, Father Michael Logan (Montgomery Clift,) apparently a model of clerical piety, hears a killer's confession. Eyewitnesses point to a priest as the murderer and the sacrament of penance forbids Logan to speak out - even in his own defense - when circumstantial evidence targets Logan as the prime suspect! Academy Award® winners* Anne Baxter and Karl Malden co-star as a former flame and a police inspector whose attempts to clear Logan only entrap him further. Filmed in Quebec on locations highlighting that city's Old World traditions, I Confess races toward a climax that's unforgettable. And in true Hitchcock fashion, you'll confess to being hooked all the way. *Baxter: Best Supporting Actress (1946) for The Razor's Edge, Malden: Best Supporting Actor (1951) for A Streetcar Named Desire. When I first read the premise of this movie, I thought this one could really be interesting. It was to a certain degree, but somehow it did not really click with me. The actors did a fine job, especially the priest. This time, the dumb character moment comes from the love interest: How could she not see from the beginning, that her story will not really give an alibi to the priest, but only give him a motive in the first place? While I watched it, I was thinking the same, but in retrospect I thought it was very clever. Hitchcock had the opportunity to do that amazing flashback sequence, but you're right in that it convinces the police of the motive and even she acknowledges it later ("why did they let me go on?"). But she had to convince them that a priest had a valid, deep enough reason to be out with a married woman and she assumed the times overlapped. The wily old copper was perfectly aware throughout though that they didn't, and so we could all watch an excruciating scene of her inadvertently digging Logan in deeper and deeper! You seem to focus on the stupidity of some characters as a narrative flaw, but I wouldn't go so far as that (naivety, panic, maybe). In any case, Hitchcock does it on purpose, to make it more shocking for the viewer, because that moment in particular was a "No! Shut up, you daft cow!" moment. That's why he stays away from mysteries; he prefers us to understand all the levels of torment. Next would be "Rear Window". Should we wait until Pete got his copy? Also I am one week behind (I watch the Hitchcock movies together with my brother and I'll have to wait until his next visit). Mine has shipped... but with free shipping I don't really expect it until probably sometime the first half of next week. So feel free to watch it... and I will watch it in my next weekend marathon. Besides.... would love to see a couple reviews before mine arrives... kinda help get me ready and more eager to watch it when it does arrive! Mine you will probably not get this week anyway. I will have to watch "Dial M for Murder" first when my brother visits this week. Also I on the other hand avoid reading the reviews of the others in this marathon, if I haven't watched the movie yet myself. Has your brother been enjoying the marathon? Or is he thinking, "oh no, I've got to go to Tom's and he'll make me watch another of his crappy old films!" He wanted to watch them, I don't force him. His reason is, that he wants to see himself why this Hitchcock fellow is so highly regarded. Until now we had about the same opinions about the Hitchcocks we watched so far. Of course it's not too late. Just tell me which ones you plan to review and I will update the list in the first post.